Forward Jack Smith netted a hat trick for the the Crusaders. There's a hockey proverb that indicates a goal scored in the first or final minute of a period will prove to be decisive. St. Cloud Cathedral proved the point emphatically Saturday at Lake George in St. 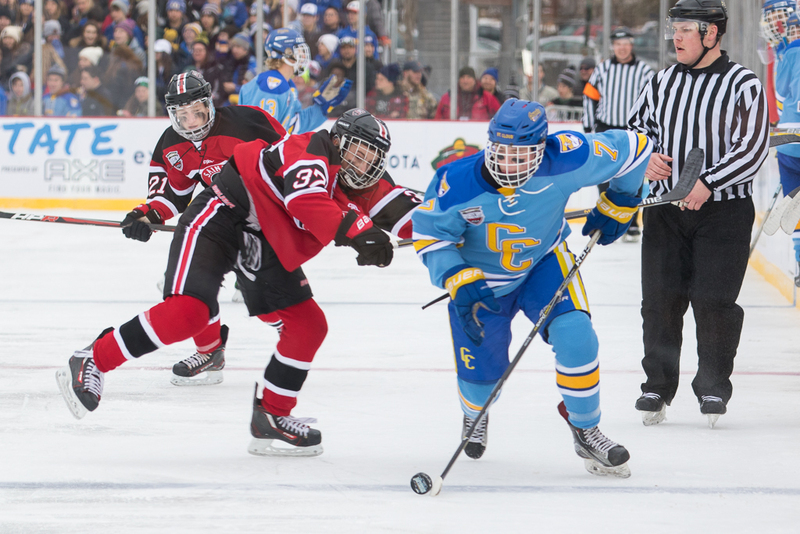 Cloud as the Crusaders netted a goal in the final minute of the second period, and the first minute of the third, tearing open a once-close game and eventually crushing crosstown rival St. Cloud for an 8-3 Hockey Day Minnesota victory. St. Cloud Cathedral sophomore Jack Smith, who finished with a hat trick and four points, netted his second goal with 18 seconds left in the second period, and the Crusaders, ranked No. 7 in the Class 1A coaches’ poll, never trailed again. Seven seconds into the third, Jackson Savoie added another tally for St. Cloud Cathedral, and the rout was on. The Crusaders (12-5-0) added three more to make it six unanswered as St. Cloud Cathedral pulled away. For a Crusaders squad that lost a lot of players from last year’s state tournament team that's now led by a talented but inexperienced sophomore group, Saturday’s victory marked a significant step forward for a team that's looking for consistency. 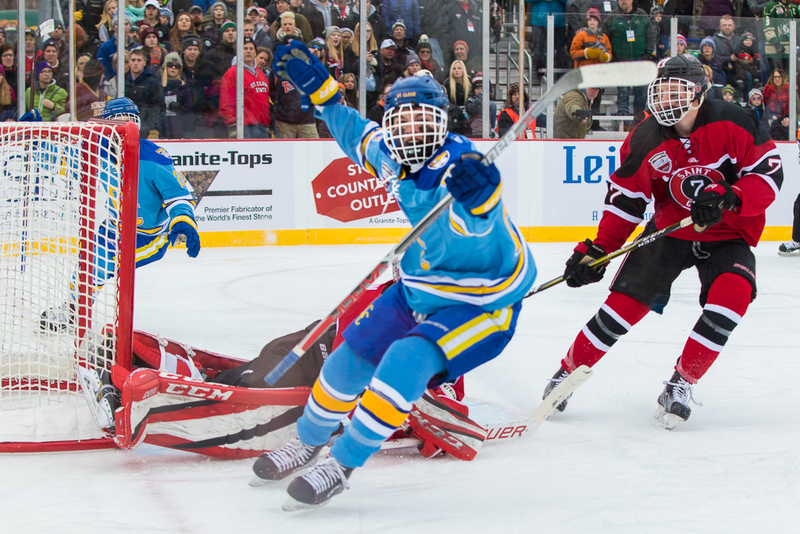 Moreover, the Hockey Day Minnesota stage and atmosphere made this victory one the Crusaders won’t likely forget. Fellow sophomore Blake Perbix added a goal and a playmaker to finish with four points as well. St. Cloud (12-5-0) had swung the momentum in its favor for long stretches early on, blocking shots, outshooting and out-hitting its rival, while carving out ample zone time. As the game wore on, however, the Crusaders' confidence grew while St. Cloud got frustrated. The physical nature of its game wasn’t producing chances, nor had it limited the Crusaders’ chances, and things began to spin out of control for No. 20-2A ranked St. Cloud. With the lead, St. Cloud Cathedral dialed back its forecheck and kept three men back, while effectively limited St. Cloud’s ability to generate its offense on transition. The victory is also a good bounce back for the Crusaders, who had dropped three of its last four games, including a shutout home loss to Delano on Thursday that left the team concerned and had its confidence shaken. Saturday’s win on the big stage before a state-wide audience might do wonders towards launching the Crusaders on a late-season run towards a return trip to the state tournament. St. Cloud Cathedral scored six unanswered goals to pull away late and bury crosstown rival St. 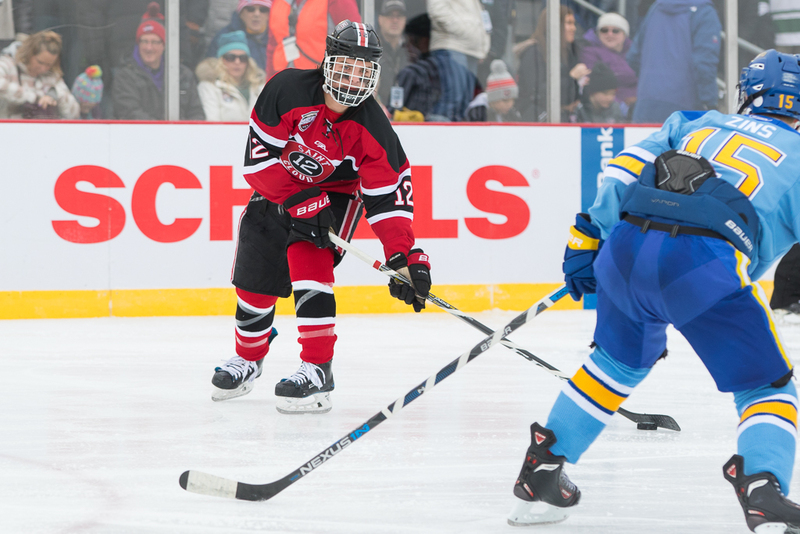 Cloud for an 8-3 victory Saturday during Hockey Day Minnesota at Lake George in St Cloud. Sophomore Jack Smith recorded a hat trick and teammate Blake Perbix netted a playmaker to help lead the Crusaders, ranked No. 7 in the Class 1A coaches’ poll, to the win. Both players finished with four points apiece. The teams swapped scores, answering each other early before St. Cloud Cathedral went on its run, turning a one-goal deficit early in the second period into an eventual rout. Perbix netted the equalizer at 6:19 when No. 20-2A St. Cloud mishandled the puck along the boards on a dump-in, and the Crusaders (12-5-0) never trailed again. Smith scored the go-ahead goal with 18 seconds left in the second period, putting the Crusaders on victory footing. For good measure, St. Cloud Cathedral added four more goals in the third to finish things off in convincing fashion. Noah Admundson earned the victory in goal for the Crusaders, making 24 saves on 27 shots. Noah Bissett finished with a goal and an assist to lead St. Cloud (12-5, 6-1), while goaltender Soren Falloon stopped 21 of the 29 shots he faced. The MN Hockey Hub polls are for entertainment purposes only.